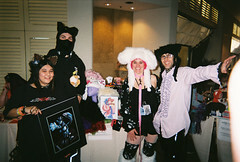 This is a photo of Keres and Sesu hanging out with us at the bunnywarez booth at furcon, and showing off the artworks they won in the auction. This was taken on Sunday afternoon by Pup. As you can see, we're having a great time! BTW, if you want to see a bigger version of the photo, you can click through to Flickr by clicking the image. We have a whole new site rev in the works, including FAQ... and we are also going to have care tags on items in the future. For faux fur, the main thing is never to use heat - wash in cold water (by hand or by machine) and air dry, or if you have access to a dryer with a no heat setting, you can tumble them with air only. They should air dry pretty quickly. You guys should totally film a cheesy little infomercial for your site... with bad casio music. hehehe.